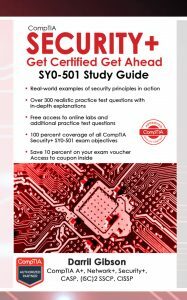 This page is dedicated to sharing errors identified in the CompTIA Security+ Get Certified Get Ahead: SY0-501 Study Guide . If you know of any errors in the book, please let me know. Unfortunately, I repeated one error several times in the book. I wrote incorrectly in the Certificate Formats section (Chapter 10) that Canonical Encoding Rules (CER) is a binary format and Distinguished Encoding Rules (DER) is an ASCII format. However, the following is accurate. Canonical Encoding Rules (CER) is ASCII. Distinguished Encoding Rules (DER) is binary. Check out the DER and CER Certificates blog post for clarification. The following errors have been corrected in the Kindle edition. Pg 82 In the Understanding Switches and Getting Help section. The following paragraph in this section isn’t technically accurate, but the difference is subtle. Check out the online Linux lab for different ways to query help on Linux systems. For getting help with ping on Linux. Drop the pipe to help. It doesn’t help. On most Linuxes/shells (including bash, the default shell on Kali, the distro you recommend), “help” is a shell built-in command that offers help on the shell itself, *not* executables that can be called from the shell (such as ping). And it ignores its stdin, so piping anything into it has absolutely no effect on its output. Furthermore, when you invoke ping without any arguments, that’s an error, so the usage message that ping spits out goes to stderr, not stdout. When you make a pipeline, only stdout gets redirected to the next command in the pipeline, not stderr (unless you add extra syntax, which you did not). So, despite the pipe, “help” was not even seeing the output of “ping”. So if, as a result of entering the above command, you saw info on how to use ping, “help” had nothing to do with it. What happened is that *both* the output of help came out (which is of absolutely no use in trying to figure out how ping works) *and* the (stderr) output of ping came out (which you would have got anyway, even if you hadn’t piped to help). If you understand identification (claiming an identity, such as with a username) and authentication (proving the identity, such as with a password), it’s easier to add in the other two elements of AAA—authorization and accounting. HOTP creates a one-time use password that does not expire. HOTP creates a one-time use password that does not expire until it is used. Pg 136 In Chapter 2, question 12. A company recently hired you as a security administrator. You notice that some accounts used by temporary employees are currently enabled. Which of the following choices is the BEST next step? 1.3 Given a scenario, implement secure systems design. Pg 169 In Chapter 3, Transparent Proxy Versus Nontransparent Proxy Remember This section. The definition for transparent proxy servers and nontransparent proxy servers is reversed. A proxy server forwards requests for services from a client. It provides caching to improve performance and reduce Internet bandwidth usage. Transparent proxy servers accept and forward requests without modifying them. Nontransparent proxy servers use URL filters to restrict access to certain sites. Both types can log user activity. Pgs 191, 199-202, 214-215 In the “IEEE 802.1x Security,” “PSK, Enterprise, and Open Modes,” and “RADIUS” sections. 802.1x should be 802.1X on these pages and throughout the book. The Security+ SY0-501 objectives consistently use 802.1x (lower case). There is an IEEE 802.1X independent standard but there isn’t an 802.1x standard, so 802.1X is technically accurate. Pg 216 TACACS+ was created by Cisco, but is not proprietary to Cisco. TACACS+ is an alternative to RADIUS. Although CISCO created TACACS+, it can interact with Kerberos. TACACS+ can be used with Kerberos. Pg 433 XOR bullet. The explanation is swapped. It should read as: If the two inputs are the same, it outputs False (or a binary 0). If the two inputs are different, it outputs True (or a binary 1). This reduces traffic sent between clients and the CA. Pg 461 In the Certificate Formats section, CER and DER are incorrectly identified as binary and ASCII, respectively. Pg 462 The following graphic shows a correction for Table 10-3. Pg 537 3DES definition in glossary. Change Digital to Data. CBC—Cipher Block Chaining. A mode of operation used by some symmetric encryption ciphers. It uses an IV for the first block and each subsequent block is combined with the previous block. firewall—A software or a network device used to filter traffic. Firewalls can be application-based (running on a host), or network-based. Stateless firewalls filter traffic using rules within an ACL. Stateful firewalls filter traffic based on its state within a session. If the two inputs are the same, it outputs False (or a binary 0).